He likes to buy a donut for Adam every Monday when we go grocery shopping, he will say all the time, "Me get a donut for daddy to make him FAT!" About the new baby sister he has said to me, "I'm a good big brother to baby boys but not to baby girls." And, "I like girls in my preschool but not girls in your tummy." At church a few weeks ago he was drawing pictures of me pregnant and kept saying, "I'm drawing pictures of you fat momma." He's lovely. The other day I was calling my sister while we were in the car and he said, "She's the only one that understands you." Kelly just reminded me of this one, He calls Santa, "Ho Ho" and he'll get mad at Xavier and say, "He's on Ho Ho's naughty list." Also, when he gets hurt no matter what it is he needs a bandaid and he always says, "I'm falling apart." Last Friday we had our Trunk or Treat at the Church. 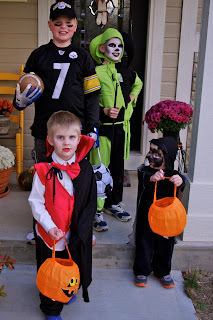 The three little ones dressed up (Damon decided last minute he didnt like his costume so he bailed on it. 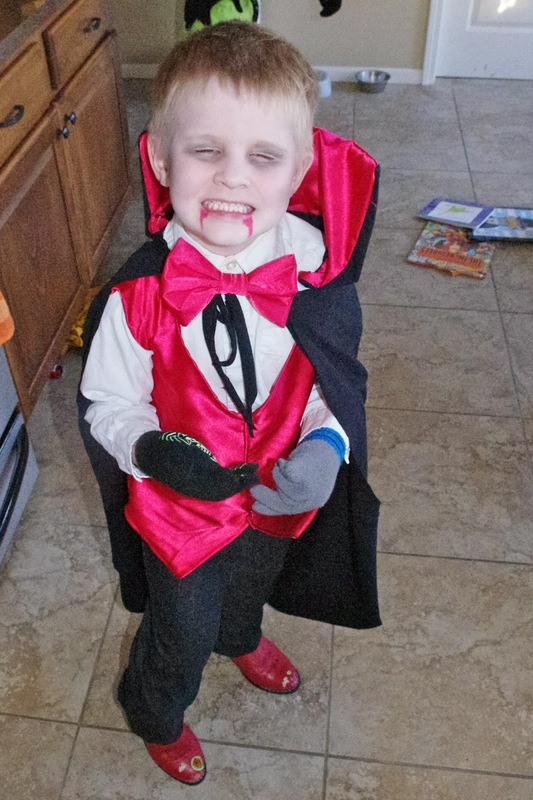 He was going to be, "Your worst nightmare" but didn't like it once he was all dressed.) Anywho, we had a good time eating chili and spending time with some friends. Plus the boys got some great candy. 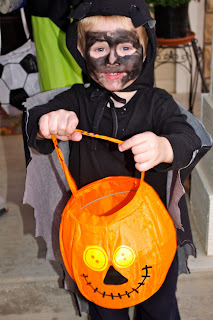 Yesterday, we went Trick or Treating around our neighborhood. We were out for 2 hours but felt like 5. Its exhausting to take 4 children trick or treating. I can't wait until we can do it next year with 5 kids! Here's Xavier as an Evil Jester...I made his entire costume, first time I've ever done that, I'm pretty proud of myself. Considering he asked to wear the pants to school, I'm thinking he liked it too. Damon went as Ben Roethlisberger (Sideline Ben). Aiden was a vampire (we couldn't find his teeth until we came home from trick or treating). 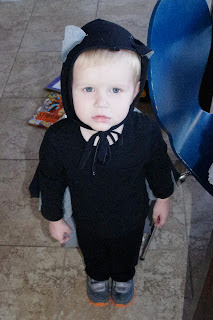 Grayson as a bat. He moves too much and seems to not like having his picture taken so this is the best shot I got of him. 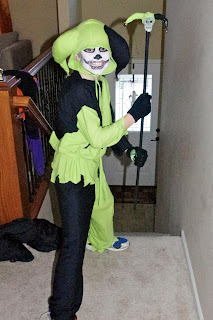 He did love trick or treating and did his best to keep up with his brothers. 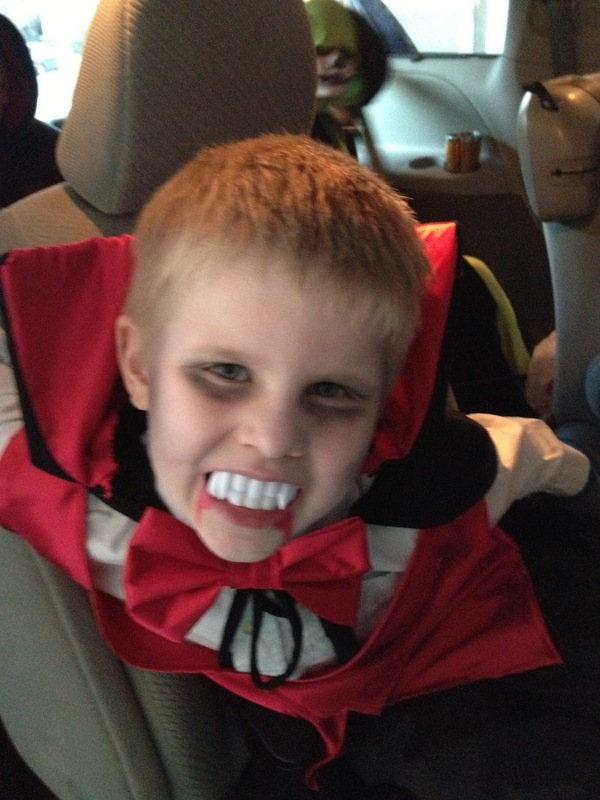 He even says trick or treat and its the cutest thing ever. I need to get it recorded.